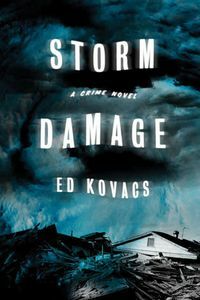 Storm Damage by Ed Kovacs, a Mysterious Review. Review: Ex-NOPD detective Cliff St. James is just getting by, running a Katrina-damaged dojo in New Orleans, when one of his last unsolved cases as a cop becomes his first case as a private investigator in Storm Damage, the first mystery in this series by Ed Kovacs. Just as the first winds of Katrina were hitting the city, Cliff and his partner Dice McCarty are called to investigate a body found in a bar, the Tiki Hut, presumably that of its owner Sam Siu. They can't do much about it other than take notes of the crime scene before having to run for cover themselves. Now, months later, Sam's daughter, Twee Siu, visits Cliff, who quit the force, asking him to take her on as a client. He feels a little guilty for having abandoned the scene, and with PI licenses easy to get, he agrees to do so … though the case has become decidedly more complicated. "The body in my father's office was never recovered," says Twee. "It disappeared. And the Tiki Hut got looted and flooded out. See, maybe you're looking for my father's killer. Or maybe you're looking for my father." Cliff quickly discovers that Sam was more than just a barkeep, and had taken out a loan of $500,000 in cash just prior to his death. Twee had $100,000 of it, but the rest was missing. "With four hundred large sitting in Sam's safe, one didn't have to look far for a motive to his murder. Not that I was a cynic, but in a town like New Orleans, I figured maybe half the population would have waxed Sam for four hundred thousand bucks. So at least I was narrowing the field." I need more simplicity in my life, not convolutions and chimeras. I liked Twee's money and I truly wanted to find Sam's killer, as much to prove my detection ability as to avenge his death. But I refuse to be abused, and during the last couple of years, I had suffered nothing but abuse, from nature, from government, from neighbors, from the chief, from my ex-wife, and now from a client who seemed unmoved by the face that her duplicity was endangering me. Life was upside down; the ruminations I'd had yesterday regarding the mental stability of the city, well, maybe the psychosis applied to me more than I cared to admit. The storyline starts simple but becomes complicated … and in a good way. There's a fair amount of misdirection, but it's not so far afield that it becomes unreasonable to consider. About the only element that doesn't really work is the timeline itself. Setting a crime novel in the aftermath of Katrina is a somewhat overused plot device, and seems ever so slightly contrived here, the author (via Cliff) reminding the reader every two or three chapters — whether or not the story warrants it — that life, the "New Normal", wasn't easy in the Big Easy after the storm. The murder investigation storyline is solid enough, and readily reconfigurable, to take place in present day New Orleans, which, to be sure, is a terrific choice of locale as it presents an interesting backdrop to the proceedings. This is a minor quibble, though, for what is otherwise a really first-rate debut. Acknowledgment: Minotaur Books provided a copy of Storm Damage for this review.